International brand-name stores now crowd high streets in Malta. But most are franchises and few can claim to have been conceived on the islands. Not so The Rug Company which has just opened its Malta showroom. Its high-end designer and bespoke rugs now grace the floors of gliterrati the world over, but you could say the company started life here and is now ‘coming home’. Suzanne Sharp co-founded The Rug Company with husband Christopher in 1997. She spoke to us about their personal story in the rug trade and what it means to bring the brand to Malta. The Rug Company showroom in Ta’Xbiex is a high-ceilinged, almost minimalist space in a new business centre just a few metres from Whitehall Mansions, home to the British High Commission. Suzanne Sharp is giving instructions in Maltese to workmen completing the finishing touches to the space; she’s at ease in the language of her early years (her maiden name is Miceli), and is instantly recognisable from international magazine photos. Both she and Christopher crop up frequently in the glossy weekend supplements of UK papers. Christopher appeared only recently in an FT Weekend magazine interview. The Sharps are clearly people on the move, as their showrooms from Dallas to Dubai and New York to Moscow testify. Today though, Susan has her sights set on their 19th successful store opening. There are rugs piled in neat rows, some wall hangings and a set of arty photos above the back counter. The showroom is deceptively simple for a product that takes around four months to complete and relies on the handcrafting techniques of the Tibetans and Nepalese that have gone almost unchanged for hundreds of years. 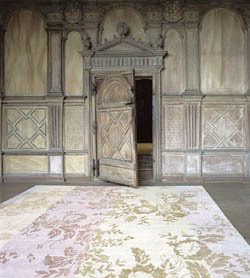 Their rugs are sumptuous heirlooms, often described as ‘works of art for the floor’, and carry four figure price tags. However, Rug Company rugs are made to last, outliving their owners to be handed down and cherished by future generations. The brand shouts high-end contemporary style, but at heart, it’s about a sense of timelessness, heritage and continuity, which seems fitting for a company now rediscovering roots with the opening of its Malta store. Flash back 14 years and shift scene just a couple of kilometres along the seafront to Qui-Si-Sana, Sliema, and you can imagine Suzanne doing much the same as now – organising her retail space. Back then, she and Christopher owned a single outlet in Malta called ‘Christopher Sharp The Oriental Rug Gallery’, which they sold in 1996 before leaving the island. The intervening years have seen the duo revolutionise the London rug trade and go global, collaborating along the way with designers like Vivienne Westwood and Paul Smith, as well as fashion houses such as the Italian label Marni. How and why the rug trade, and why Malta then and now, is a personal tale that starts in Saudi Arabia moving to Italy before arriving on the islands in the winter of 1990. It’s one Suzanne is fond of telling. She had left Malta in the late ‘70s as teen when her father, an Air Malta executive, was posted first to Rome, then London. She met and married Christopher in London in the ‘80s and moved with him to Saudi Arabia where he worked as a film maker and broadcaster. “Our interest in rugs started in Saudi. There was little to do socially, so we stayed in homemaking. We decorated our house with rugs bought at the souks, often from Afghan traders selling their wares to pay their way to Mecca,” Suzanne explains. Saudi souks were to give them a deep understanding of what was to become their stock in trade. After four years in Saudi, they left for Tuscany with the aim of opening a boutique hotel. But frozen to the bone visiting pile after pile of rubble on windswept hills amid a bleak wintery landscape, they realised their dream was downgrading rapidly to a B&B, if that. On a Christmas trip back to Malta in 1990, by now with their two-year-old son Nick in tow, Suzanne’s family persuaded them that life was beautiful down south. “We rushed back to Tuscany, packed up, paid bills and drove down to catch the ship from Naples to Malta. We arrived in Grand Harbour at sunset, and Malta seemed warm, shimmering and golden. A sign of better times to come,“ Suzanne says. Still bitten by the rug trade, the two saw a niche in the local market and opened their Qui-Si-Sana outlet offering top-end, traditional Persian carpets. Two more children and seven years later, the serial movers decided to decamp back to London ready to take another punt in a trade they now knew intimately. The Rug Company was born. Nowadays, interior design magazines are cover to cover with the bare floorboard (in Malta’s case, bare stone) and statement rug look, but without the Sharps, it might not have come to pass so quickly nor been so pervasive a trend. Always ahead of the market, the duo, who were now also designers rather than pure retailers, were on the move again. “We couldn’t base a shop on one style idea. So, in 2001 we sought top-name designers to create unique ranges for our contemporary collection,” Suzanne adds. Even through the credit crunch The Rug Company was doing well. “I think people see them as investments. You don’t think about spending on fixtures like kitchens and bathrooms, and they can’t move with you. A rug can – it’s personal. We offer a bespoke service tailor making rugs like you’d have a suit or wedding dress made,” Suzanne explains. But what of Malta’s capacity now to appreciate the qualities, durability and design of the Rug Company’s offer? 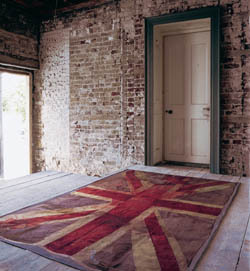 “There were always people in Malta back in 1997 who appreciated the quality of the rugs we offered. But now the time is right, the market grown; look at all the new condos, penthouses and marina developments, and our earlier clientele are also thirsty for something new on the market here,” she says. Locals’ appreciation of design steers our conversation back to Valletta and also to its bid to be a European Capital of Culture in 2018, an initiative which is talking of the city’s role in inspiring design and innovation and stimulating a creative economy. Suzanne’s path with The Rug Company is evidence that a creative career can bring benefits in terms of both personal fulfillment and financial gain. Suzanne is clearly fond of her homeland and has managed to take time to show her London PR assistants around Valletta, pointing out all the grand sights and quirky elements that make up the personality of Europe’s most diminutive capital. It’s mid October, it’s hot and feels like summer as we speak. Suzanne’s biog on company’s website says her favourite view is ‘the big blue sea on a sunny day in the Med’. Her assistants say they’d like to linger longer in Malta. “I hope Valletta won’t end up with European blandness,” she muses, recalling the manicured Tuscan hill towns she once trekked around in search of paradise. “I love the character of the old bars and shops in Malta.” She has a house in Attard and holidays here, surrounded by an extended family of Maltese relations. All the while, you sense that to Suzanne, The Rug Company’s Malta showroom means more than just another store notched up. It holds a special place for the Sharps in their story. You also sense that Suzanne may be about to follow quite closely Malta’s interest in a creative economy. 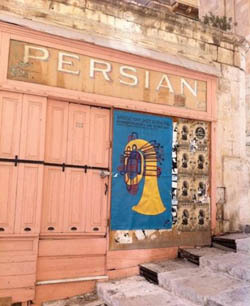 The Rug Company may be a global brand, but perhaps it’s come home and is about to make its mark in Malta again. A very interesting and well written article. Having worked in the rug and flooring environment in London for a number of years, I can recognise how much skill and effort has gone into developing this business. Good luck Suzanne and Christopher – may this new venture be a great success!